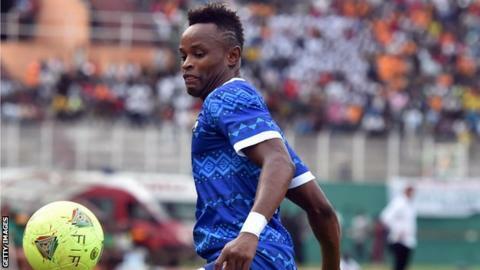 Sierra Leone suffered a 1-0 defeat away to Chad in the first leg of their 2018 World Cup preliminary round qualifier on Saturday. The match was played in N'Djamena and was settled by a goal early in the second half. Leger Djimrangar struck for the hosts in the 47th minute to give them the advantage going into the second leg. The result will be seen as a blow to Sierra Leone who are ranked 54 places higher than Chad in the world rankings. The Leone Stars are still barred from hosting matches because of fears over the Ebola virus. They will therefore play the return leg on 13 October in Port Harcourt in Nigeria. It will be the second time that Sierra Leone have used the venue for one of their qualifiers. Last month they held African champions Ivory Coast to a goalless draw there in a 2017 Africa Cup of Nations qualifier. The overall winners of the tie will play Egypt in the next round. The match in N'djamena was Sierra Leone coach Sallas Tetteh's second game since he took over in August on a three-month deal following an agreement between the Sierra Leone Football Association and the Ghana Football Association. Tetteh was forced to pick a squad without talismanic Sierra Leone striker Kei Kamara who announced he was taking a break from international football. Elsewhere on Saturday, Madagascar took a big step towards the next round of World Cup 2018 qualifiers with a 3-0 win over the Central African Republic. Chad should have been hosting the first leg of this first round tie, but Fifa moved the game to Antananarivo because of violence in Bangui. It means the Central African Republic will have played both legs in the huge Indian Ocean island. Madagascar took the lead against CAR in the 27th minute through Michael Rabeson. A second goal followed for Madagascar 12 minutes later from Njiva Rakotoharimalala which ensured that they went into the break with a 2-goal lead. The second leg will take place on Tuesday 13 October in Antananarivo. The overall winners of this tie will play Senegal in the next round of World Cup qualifiers. The Central African Republic were also forced to give up home advantage during the last World Cup qualifying campaign when rebel attacks on Bangui led to the overthrow of the government in 2013. Also on Saturday, Eritrea were beaten 2-0 at home by Botswana in the first leg of their first round World Cup tie. It was a predictable outcome as Botswana are ranked 91 places above Eritrea in the world - the widest gap among the 13 first-round match-ups. Galabgwe Moyana gave Botswana the lead midway through the first half, with a 22nd minute strike. Joel Mogorosi made it 2-0 for the visitors with a goal in the 64th minute. Eritrea are still without a World Cup win after seven matches spanning four qualifying tournaments. The winners of this tie will face Mali in the next round. There will be three second legs on Sunday and a further 10 on Tuesday with the overall winners joining the 27 top-ranked African teams in a second round of home-and-away eliminators during November.